This salad might steal the show before the main dish arrives. Don’t fret — this elegant dish is easy to make (in just 20 minutes) to impress your guests. It’s flavorful and fresh, and the blueberries add an unexpected sweetness. Drizzle with homemade lemon-Champagne vinaigrette for added sophistication. 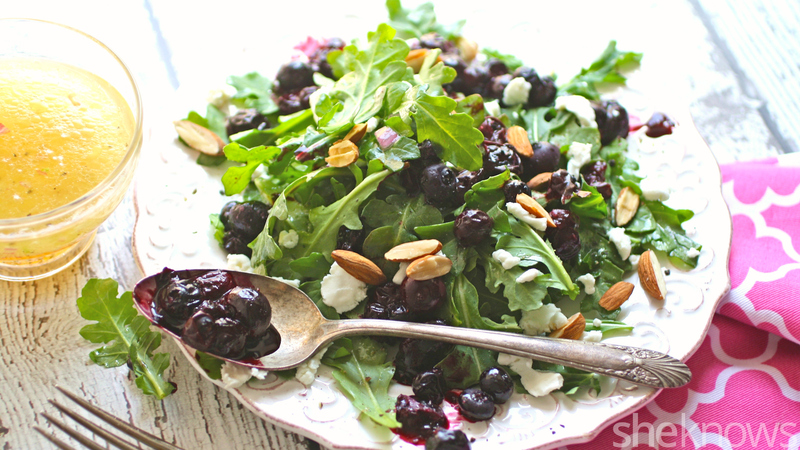 Adding fresh blueberries to a salad is pretty special, but there’s a way to take things up a notch. 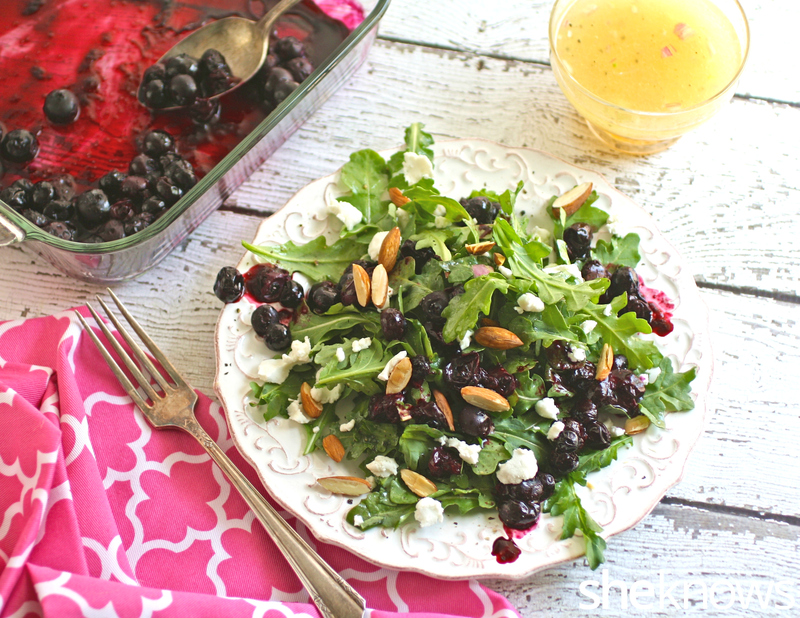 Have you tried roasting blueberries? When you do, they burst with flavor (literally and figuratively), and their warm juices flow to coat whatever you’d like to use them on. This Meatless Monday salad takes only 20 minutes to prepare, and that includes time to make the lemon-Champagne vinaigrette, roast the blueberries, toast the almonds and a few final minutes for plating it up. You’ll love this salad with all its vibrant flavors that combine for a special dish. 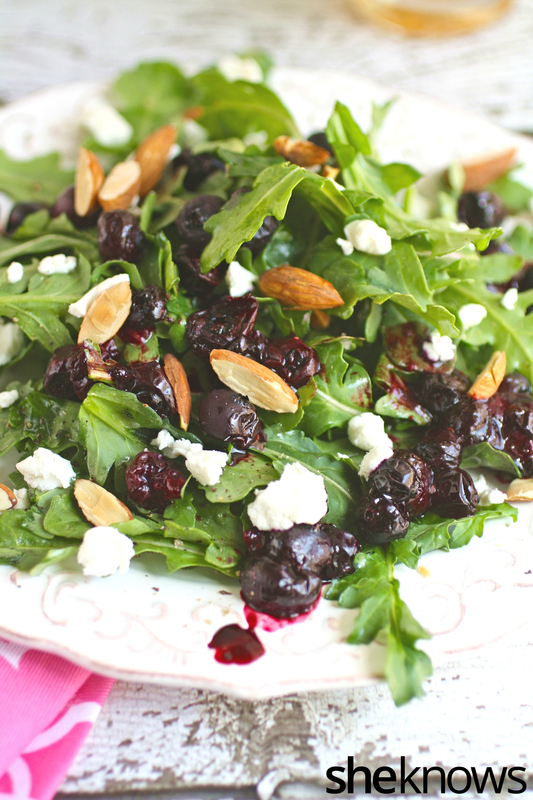 Warm blueberries atop fresh greens make for an elegant salad. This is a lovely dish to serve on a special occasion or anytime you want to make a meal special. To a medium bowl, add all the ingredients, and whisk to combine. Refrigerate until ready to use. Stir before using. Heat the oven to 425 degrees F. To a shallow baking dish, add the blueberries in a single layer, and sprinkle with the sugar. To a baking sheet, add the almonds. When the oven is hot, place the blueberries and the almonds in the oven. Toast the almonds, tossing once, for 3 to 4 minutes or until lightly toasted. Remove, and set aside. Continue to cook the blueberries, tossing once, for a total of about 10 minutes or until the berries begin to burst and release some of their juices. Remove from the oven, and squeeze the lemon juice over the top. Set aside. To a large bowl, add the arugula. Add 2 to 4 tablespoons of the vinaigrette to the greens, and toss to coat. Divide the greens evenly between 2 plates. Spoon the blueberries on top of each. Crumble the goat cheese over each plate, and sprinkle with the toasted almonds. Season with fresh ground black pepper.